For the first time in North America, 300 children from 6 continents and 22 countries will flood Stratford, Ontario for the 14th World Festival of Children’s Theatre (WFCT). The WFCT is one-of-a-kind event that brings the world’s children together to share each other’s stories and culture through theatre. This year’s theme is “My World, Our Planet” and performances will take place from June 5th-14th, 2016. Ensuring that as many students as possible are a part of this global experience, the Digital Human Library (dHL), the Foundation for Education Perth Huron and the Avon Maitland District School Board (AMDSB) will be live streaming the Festival performances daily at 1PM EST. To watch the performances, simply visit the Digital Human Library (dHL), the Foundation for Education Perth Huron or the Avon Maitland District School Board (AMDSB) website to tune in! Traditionally, each country’s festival reflects its own culture, and allows its children to show each other how they work in theatre, and to share both their ideas and their views of the world. 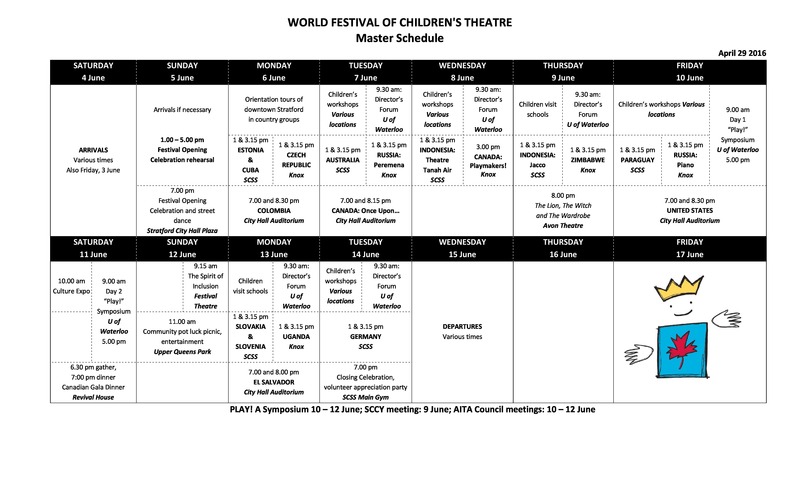 More information about the Festival, including the full calendar of performances and information about purchasing tickets if you’re in the area, can be found on the World Festival of Children’s Theatre website, and the WFCT Facebook page. #WFCT brings the world’s young people together to share each other’s stories & culture through theatre bit.ly/WFCT_dHL #CanEdu RT!